It’s been nearly five years since Ben Wyse ’99 launched Wyse Cycles, based on a simple, and unprecedented, premise: opening a bike shop with no shop. Instead, Wyse makes house calls and site visits on his own bike, towing a trailer full of tools and spare parts behind him. As far as he knows, Wyse Cycles was the first business in the country to use this “mobile bike shop” model (maybe tied with another one in Chicago that began right about the same time). One of the unforeseen, tricky bits of his unconventional approach was convincing distributors that he was a legitimate businessman, not some biker trying to game the system for parts at wholesale prices. Eventually, though, they came around, and Wyse hit the road to work the bike repair circuit. It’s become a year-round, full-time job. He’s typically out at least once a day on a call. His longest day yet sent him riding 20 miles from job to job, back and forth across Harrisonburg. Take his word for it: it’s a long way to pull a trailer that weighs between 100 and 150 pounds. Wyse Cycles rolls to EMU at least once a week to hold a walk-in bike-repair clinic that’s been getting busier and busier recently. Wyse has taught a bike maintenance and repair class here for the past four years, during which biking has become more of a thing among students. With no shop space to rent, Wyse can keep his overhead, and the prices he charges, low. That also frees him to spend time during his regular workday biking, rather than driving, from job to job, and to take on some low- and non-paying jobs fixing bikes for people who couldn’t otherwise afford it. “One of the beautiful things about the bicycle is it’s accessible to a wide swath of the public,” says Wyse, who would love to do more to promote biking beyond the somewhat smaller swath of customers with ability to pay him, though this has to be balanced against the economics of supporting his family with three young children. The low financial barrier to entry is just one of the beautiful things about the bicycle and the “bicycle lifestyle,” as he refers to it. His first brush with it all was entirely pragmatic. He bought his first bike because he needed a way to get to a summer job during college. The more he rode, though, the more it made sense. Biking was fun, it was friendly, it was clean and green and healthy, and before long, the bicycle grew into an object that fit squarely into Wyse’s thoughts about (and even theological understandings of) community, simple living, peace and sustainability. 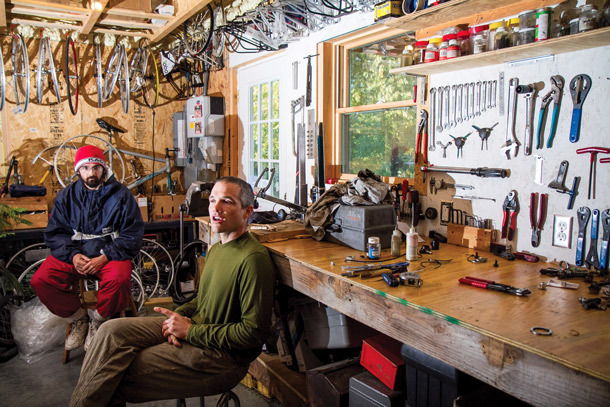 “[Biking] is fundamentally about moving us toward something that’s more whole and healthy for the human community,” he says, sitting in his basement workshop, surrounded by bikes, tools and bucket-after-overflowing bucket of parts gleaned from the bicycle graveyard outside. A fuller realization of that vision for wholeness and health will require more people living the bicycle lifestyle. Wyse chips away at that from his end, applauds the work of others who’ve been active in the community to make it a better, safer place to bike, and laments the fact that it takes such persistent effort to put better infrastructure in place. Many in the area have cheered as the city has garnered recognition in recent years from state and national groups as a good place to bike. Wyse, though, sees these as a bit of a disappointment, in that they overstate the degree to which the city is making the bicycle lifestyle an easier one to live. Then again, frustratingly slow though it can be, change is happening. Go check out the crowded racks at the city’s middle school, he says. There weren’t nearly so many students riding a few years back. Not long ago, Wyse did a simple re-fit for one of his customers, who, as her pregnancy progressed, needed some adjustments to keep comfortably riding beside another child of hers to elementary school. What if, someday, that sort of thing becomes the norm? Wyse asks. It’s where he hopes we’ll end up: a time when riding bikes isn’t special, isn’t niche, isn’t unusual, when kids ride, when old people ride, when it will be entirely non-remarkable to see a pregnant woman riding down the street with a child wobbling along beside her.